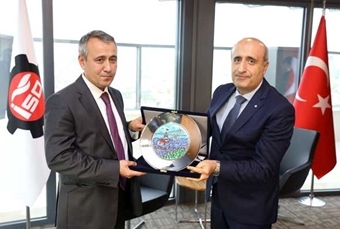 As part of an official visit to Turkey, a delegation of the Ministry of Economy of Uzbekistan paid a visit to Istanbul Chamber of Industry (ICI). The delegation led by Bekenov Husanovich, Deputy Minister of Economy of Uzbekistan, was hosted by ICI Board Member Bekir Yelken. The talks held at Odakule with Ulugbek Azamov, Counselor on Trade and Economic Relations at the Embassy of the Republic of Uzbekistan in Turkey, and Aziz Urunov, Division Head at Ministry of Economy, in attendance, tackled the ways to develop bilateral economic relations. Bekir Yelken, ICI Board Member, described as an important development the latest arrangements that grant multiple-entry, one-year visa to Turkish business people in three days. Yelken said that Turkey is the fourth largest importer from Uzbekistan, and the fifth exporter to this country and informed that Uzbekistan harbors around 520 Turkish firms that operate in a wide array of sectors, mainly in textiles, industry and contracting, and employing approximately 50,000 people. Yelken reminded that Turkish companies have invested around $US 1 billion in Uzbekistan, and there are 228 Uzbek businesses in Turkey. During the meeting, Yelken noted they could prepare a guide for investing in Uzbekistan. He said that Turkish Airlines’ Istanbul- Samarkand scheduled flights effective from March 16, 2018 would get the two sister countries even closer, stressing how much value it would add if other airlines followed. Bekenov Husanovich, Deputy Minister of Economy of Uzbekistan, called out Turkish companies to invest in Uzbekistan. Elaborating on the new investment areas and free zones in Uzbekistan, Husanovich stated that pharmaceutics and agriculture were available to receive investments. Husanovich added that they designated priority investment areas in 14 cities, including Samarkand, Khorezm, Bukhara, and Navoi. Also during the visit, ICI representatives informed that they were going to hold an Uzbekistan Country Day event on January 25, 2018.